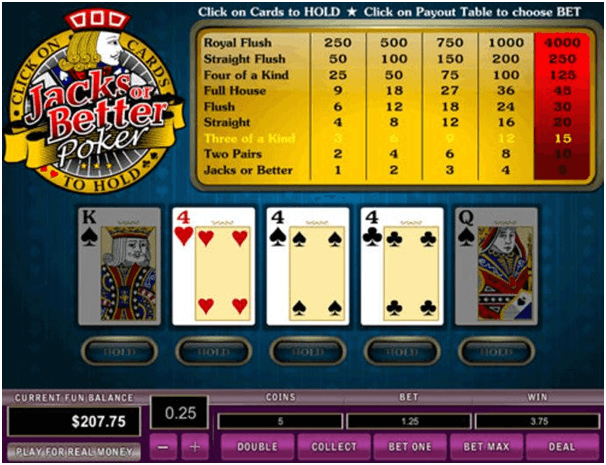 Why is Jacks or Better best video poker game to play at online casinos? Home » Answers to Common Questions » Why is Jacks or Better best video poker game to play at online casinos? If you are interested in video poker game then online casinos are full of such games. The unique thing is that these video poker games have over a hundred different variations to choose from. As a new player you often get confused as which poker variant you should select to play that is easy to beat the odds. The best video poker game to play at online casinos is Jacks or Better. The reason being that it is not only a high-paying video poker variant, but it’s also one of the best-paying casino games over the time. Also applying the best strategy can even make you achieve 99.54% payback which means a pro player will only deal with a 0.46% house edge. 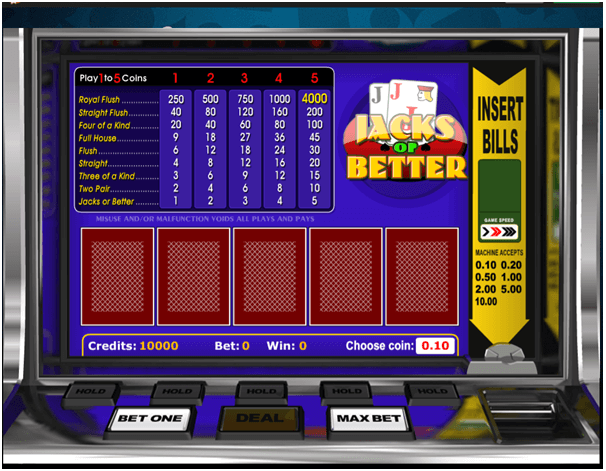 Jacks or Better is also very popular video poker game at online casinos. Even few land casinos in Australia and Las Vegas casinos in Nevada, Illinois, Indiana, Michigan, Missouri, and Oklahoma have this game for players to enjoy. How to play Jacks or Better? 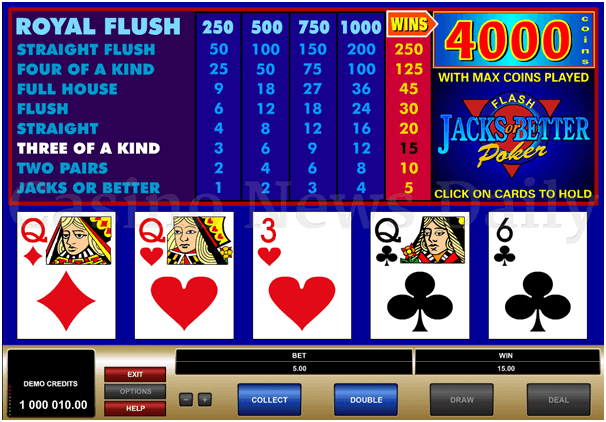 Jacks or Better video poker is quite easy to play and the best game that you can start with as a new player. In this game there are no bonus payouts, multipliers, or multi-hand formats to worry about. Instead it has a simple paying process. All you need is to find an online casino that offers Jacks or Better video poker. Register at the casino and fund your casino account with real AUD or BTC to play real money Jacks or Better game. Then grab the welcome bonus and visit the games lobby. Now choose video poker and select Jacks or Better game. You start by betting between 1 and 5 coins. You should play all 5 coins if you want to qualify for maximum payback. The reason why is because the royal flush payout increases disproportionately when winning with 5 coins (4,000 credits), versus 4 coins (1,000 credits). When you’ve chosen your coin size, the next step is to click Deal to receive your hand. Decide what cards to hold and discard. Click Draw when you’re finished, and discards will be replaced with new cards. You’ll either receive a payout or lose your bet, depending on the hand. Click Deal to play another hand with the same number of coins. Or you can change your bet before starting a new hand. But if you’re wagering 5 coins, as recommended, you won’t have to worry about changing your bet. Along with being easy to play, Jacks or Better also features simple strategy when compared to most video poker games. You can also use both a basic and advanced strategy chart to achieve nearly the same payback – the difference is only 0.08%. To make some wins at Jacks or Better Video Poker you should know as how to play the hands. Discard the fifth card whenever you have four cards to a Royal Flush, even if that card gives you a Pair or a Flush. Three of a Kind, a Flush, a High Pair, and a Straight all outrank three to a Royal Flush. Play three to Royal Flush when you have lower hands such as a Low Pair or four to a Flush. Keep a High Pair, a Straight, and four to a Flush whenever you have two cards to a Royal Flush. Do not break up a made Flush or a Straight unless when you need only one card to make a Royal Flush. Always keep a High Pair over four to a Flush and four to a Straight. Do not break up a Full House, Three of a Kind, Four of a Kind, or Two Pair. Keep a High Pair unless you have four cards to a Straight Flush or four cards to a Royal Flush. Keep a Low Pair over three cards to a Straight Flush or four cards to a Straight. If you are not dealt any of the above hands, basic Jacks or Better strategy will advise you to discard all cards and draw five new cards. 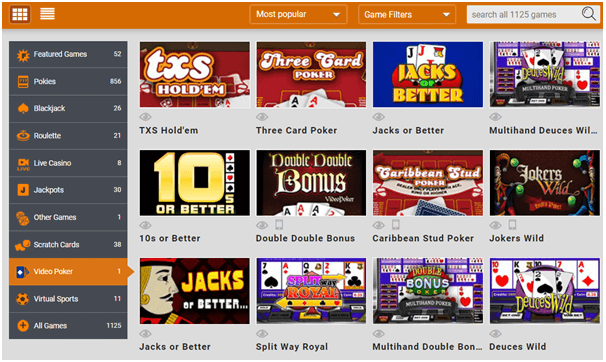 Jacks or Better has many game variants to play at online casinos. This game is must for new players who wish to learn the basics of betting and know the strategy to play such poker games with real money. Can You Access The Pokies Sites That Are Blocked?